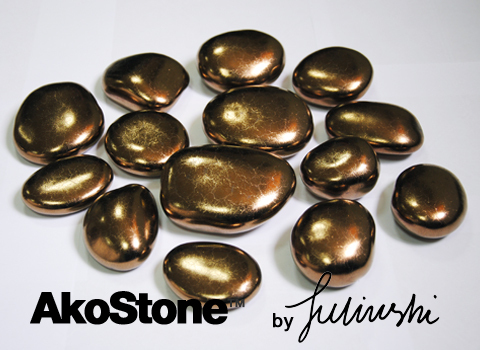 AkoStone ID 01 design by Akii Juliushi are exclusive ceramic stones of unparalleled, cosmic shine. Each piece is individually handcrafted. Bio-fireplaces decorated with AkoStone look very attractive. A single packet contains 14 pieces of black AkoStones. The AkoStone stones are designed for the Bio-fireplaces. They resist 1080°C. AkoStone is produced in Europe. AkoStone is encased in secure cardboard packaging with bubble wrap. Original AKOWOOD products contain the company's trademark on the packaging. 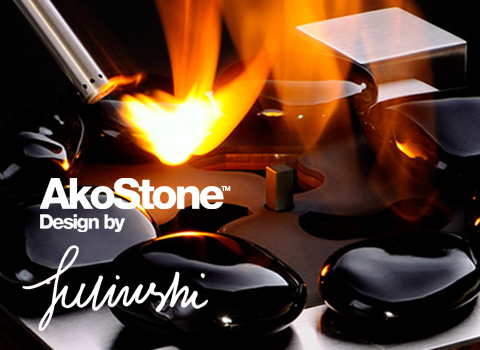 AkoStone ID 02 design by Akii Juliushi are exclusive ceramic stones of unparalleled, cosmic shine. Each piece is individually handcrafted. Bio-fireplaces decorated with AkoStone look very attractive. A single packet contains 14 pieces of white AkoStones. NEW! 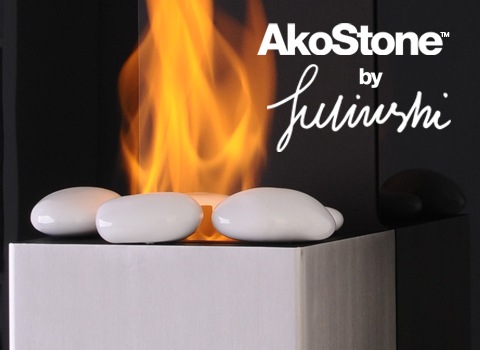 AkoStone ID 03 design by Akii Juliushi are exclusive ceramic stones of unparalleled, cosmic shine. Each piece is individually handcrafted. Bio-fireplaces decorated with AkoStone look very attractive. A single packet contains 14 pieces of old gold AkoStones. AKOWOOD ID 01 is a perfect imitation of wooden logs from various wood types. Each piece is individually handcrafted. Bio-fireplaces decorated with AKOWOOD Original look very attractive. 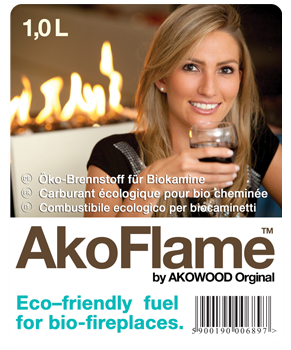 AKOWOOD Original are designed for the Bio-fireplaces. AKOWOOD Original will resist heat up to 1080°C. AKOWOOD Original is produced in Europe. The set "Beech" consists of 5 logs imitating beech wood. AKOWOOD Orginal is encased in secure cardboard packaging with bubble wrap. Original AKOWOOD products contain the company's trademark on the packaging. AKOWOOD ID 02 is a perfect imitation of wooden logs from various wood logs. Each piece is individually handcrafted. Bio-fireplaces decorated with AKOWOOD Original look very attractive. 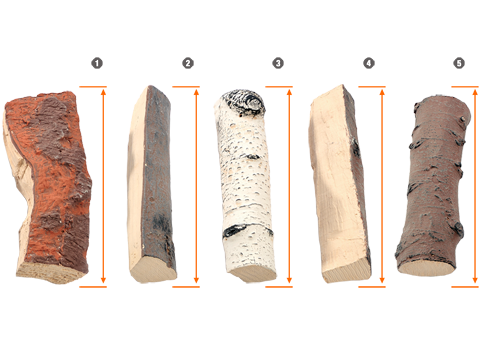 AKOWOOD Original are designed for the Bio-fireplaces. AKOWOOD Original will resist heat up to 1080°C. AKOWOOD Original is produced in Europe. The set consists of 5 logs imitating different wood logs. Bestseller! AKOWOOD ID 03 is a perfect imitation of wooden logs from birch wood logs. Each piece is individually handcrafted. Bio-fireplaces decorated with AKOWOOD Original look very attractive. 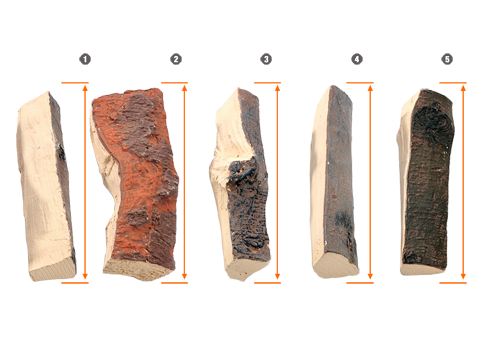 AKOWOOD Original are designed for the Bio-fireplaces. AKOWOOD Original will resist heat up to 1080°C. AKOWOOD Original is produced in Europe. 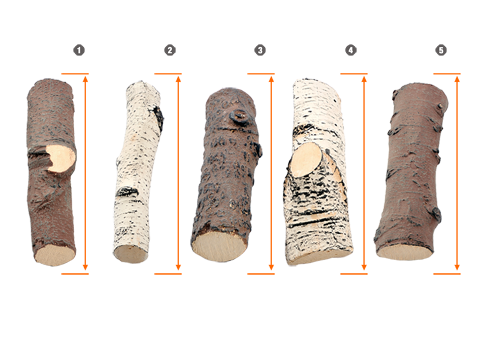 The set "Birch" consists of 5 logs imitating birch wood logs. AKOWOOD ID 04 is a perfect imitation of wooden logs from different wood logs. Each piece is individually handcrafted. Bio-fireplaces decorated with AKOWOOD Original look very attractive. 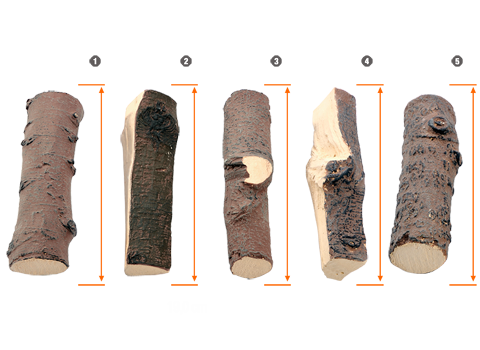 AKOWOOD Original are designed for the Bio-fireplaces. AKOWOOD Original will resist heat up to 1080°C. AKOWOOD Original is produced in Europe. The set consists of 5 logs imitating different wood logs. length: 18,5 cm, 18 cm, 17 cm, 19 cm, 18 cm. AKOWOOD ID 05 is a perfect imitation of wooden logs from birch wood logs. Each piece is individually handcrafted. Bio-fireplaces decorated with AKOWOOD Original look very attractive. 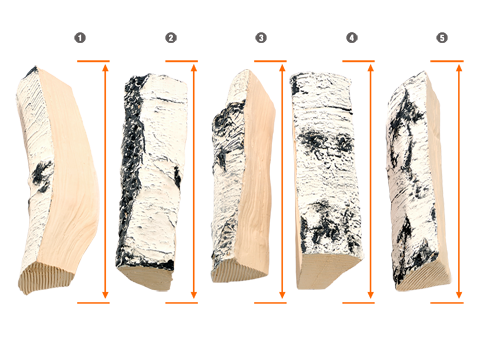 AKOWOOD Original are designed for the Bio-fireplaces. AKOWOOD Original will resist heat up to 1080°C. AKOWOOD Original is produced in Europe. 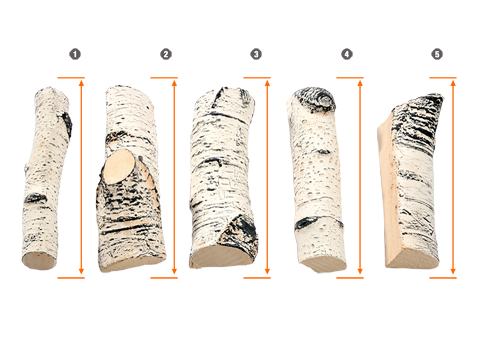 The set "Birch" consists of 5 logs imitating birch wood. AKOWOOD ID 06 is a perfect imitation of wooden logs from various wood logs. Each piece is individually handcrafted. Bio-fireplaces decorated with AKOWOOD Original look very attractive. AKOWOOD Original are designed for the Bio-fireplaces. AKOWOOD Original will resist heat up to 1080°C. AKOWOOD Original is produced in Europe. The set consists of 5 logs imitating different wood logs. length: 18,5 cm, 20 cm, 19 cm, 19 cm, 19 cm. 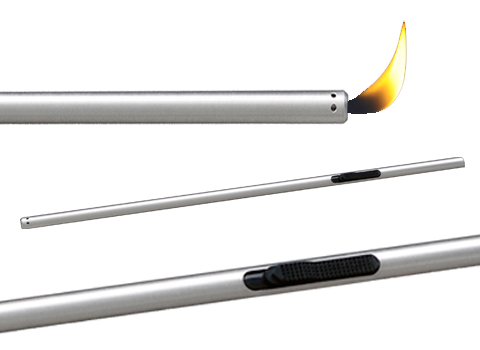 AkoFlame™ is a innovative fuel for bio-fireplaces and devices allowing open fire. AkoFlame™ is a regenerative energy source. AkoFlame™ is a AKOWOOD Orginal brand.